To listen to WGCU interview by John Davis and including Bob Rauschenberg Gallery Director Jade Dellinger click here. Lectures at Bob Rauschenberg Gallery, Fort Myers, Florida Feb. 7 and New McEachern Art Center (Mercer University), Downtown Macon, Georgia, Feb. 12. Music by Kevin Mahoney. Poster by Connie Hwang. Sean Miller Gallery Talk: 3PM, Sunday, Sept 16th, Cade Museum for Creativity & Invention, Gainesville, FL. 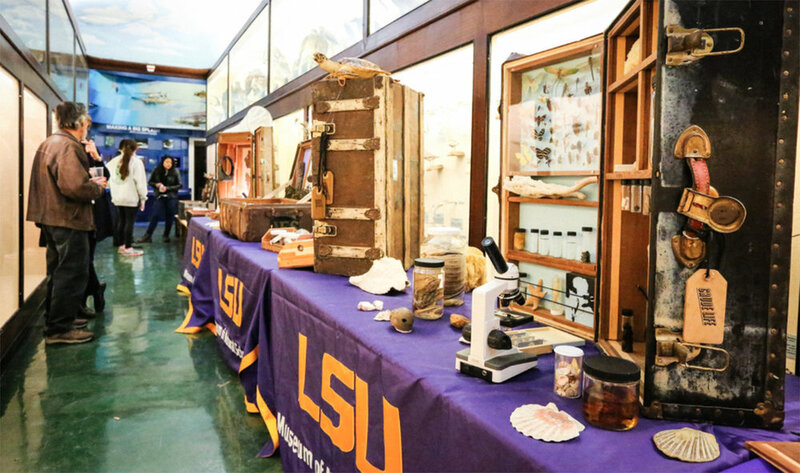 The Crude Life Portable Museum, A Citizen Art and Science Investigation of Gulf of Mexico Biodiversity after the Deepwater Horizon Oil Spill, popped into the LSU Museum of Natural Science in January, 2018, making a splash for curious visitors wanting to escape unusually icy weather in Louisiana. Learn more about the museum from its creators below! THE PURSUIT, IT'S SCIENCE, IT'S ART, IT'S CRUDE LIFE. National Academy of Sciences, Beckman Center of National Academy of Sciences, Irvine California, Nov. 7, 2017. Artist/Biologist Dr. Brandon Ballengée, Artist Sean Owen Miller and LSU Undergraduate Student Link Morgan discuss the interdisciplinary project “Crude Life: A Citizen Art and Science Investigation of Gulf of Mexico Biodiversity after the Deepwater Horizon Oil Spill”. 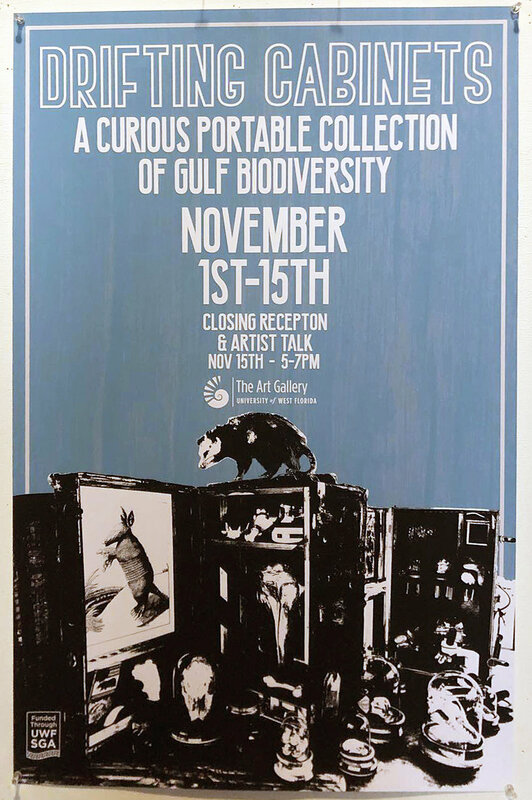 Crude Life raises public awareness of local species, ecosystems, and regional environmental challenges through community “citizen science” surveys and a portable art-science museum of Gulf biodiversity. The museum has travelled to community events such as Mardi Gras, Blessing of the Shrimp Fleets, the Rougarou (“Cajun Werewolf”) Festival, Fishing Rodeos, and others, as well as schools, parks and even the Louisiana State Senate to inspire and inform Gulf residents about their local nature. For the talk, Sean Miller discusses portable art, the relationship between art objects, specimens, artifacts, and the aura of the museum, and his ongoing work founding and co-founding alternative spaces and portable museums. Link Morgan, a Louisiana native, discussed his personal experiences utilizing the Crude Life art and science project to engage Gulf residents. While, Brandon Ballengée talked about “missing” Gulf species of fish following the 2010 spill and the integration of Art into the STEM educational programming to create STEAM and other novel art-sci outreach strategies. By Brandon Ballengée, Ph.D., Postdoctoral Researcher Louisiana State University Museum of Natural Science and Artist Sean Miller, Associate Professor, School of Art and Art Histor, University of Florida Link Morgan, Undergraduate Student (Biology Major) Louisiana State University Museum of Natural Science. Laguna Art Museum Art and Nature Festival 11/5, Aquarium of the Pacific 11/6, National Academy of Sciences Convention Exhibition 11/7-11/17. 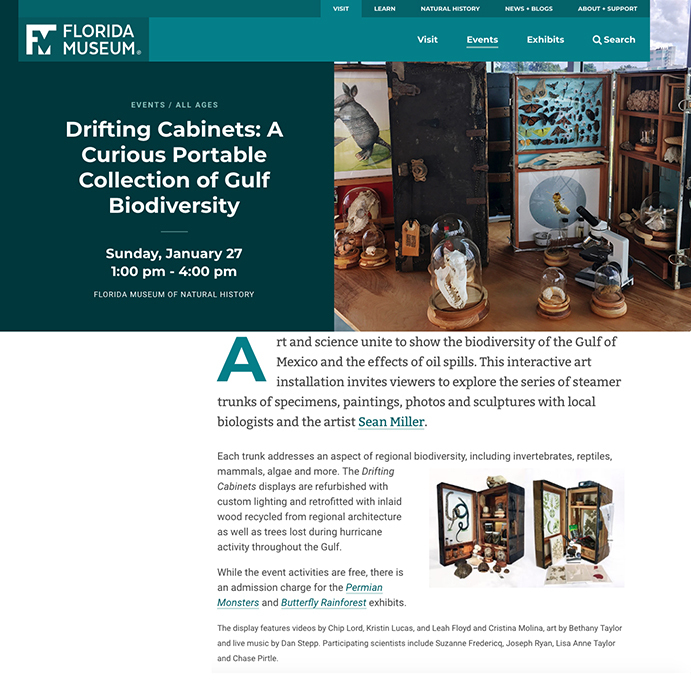 The pop-up exhibitions offered by the portable museum include a series of 10 retrofitted sea chests featuring specimens, artworks, and information regarding biodiversity in Gulf of Mexico after the BP Oil Spill. The repurposed sea chests feature watercolors painted with water from Hurricane Irma, wood recycled from the architecture of New Orleans and Gainesville, Florida and trees felled by Hurricane Irma.